I was lucky enough to win a $2,000 Gift Card to Lowe’s at the end of June from this blog: charlesandhudson.com. I entered everyday by commenting on the post and somehow I got chosen! It couldn’t have come at a better time. When we put our last house on the market we left the washer and dryer out of the listing – we bought them about 5 years ago and they are in good shape – and we were thinking that whoever bought our house might want to negotiate them in. So we left them out. They didn’t negotiate them in, which at first we thought was great – 2 less things we need to buy when we move in. We failed to take into account that the dryer we had was run on Gas. The neighborhood we live in now doesn’t even have Gas as an option. Once again – good timing for a Gift Card! On top of that it was July 4th – everyone loves a good appliance sale to celebrate America! AND – when I filled out my USPS change of address form they mailed me a 10% OFF your entire purchase at Lowe’s. Not too shabby. 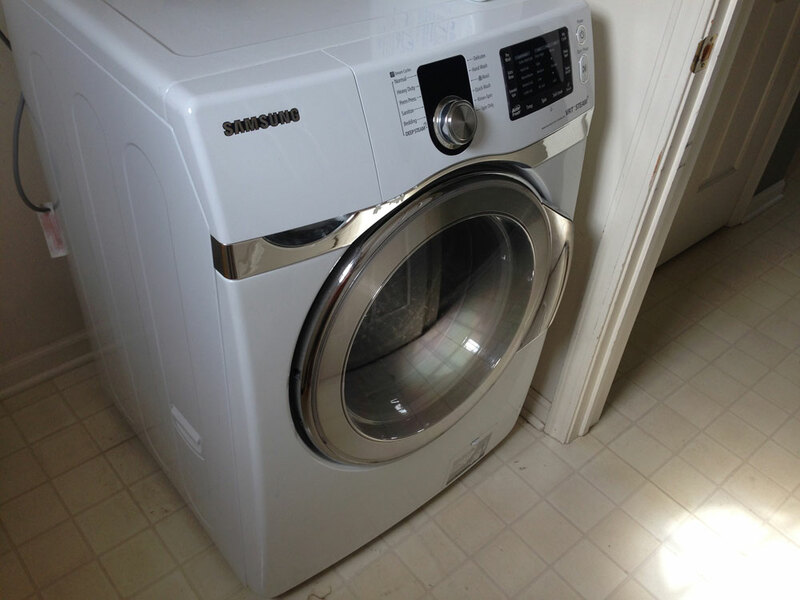 Since we still have our 5-year old Samsung front loader washer and we haven’t had any issues with it we decided to get an Electric dryer very similar to the Gas one we had to get rid of (Mark’s parents bought it off of us so it went to a good home). 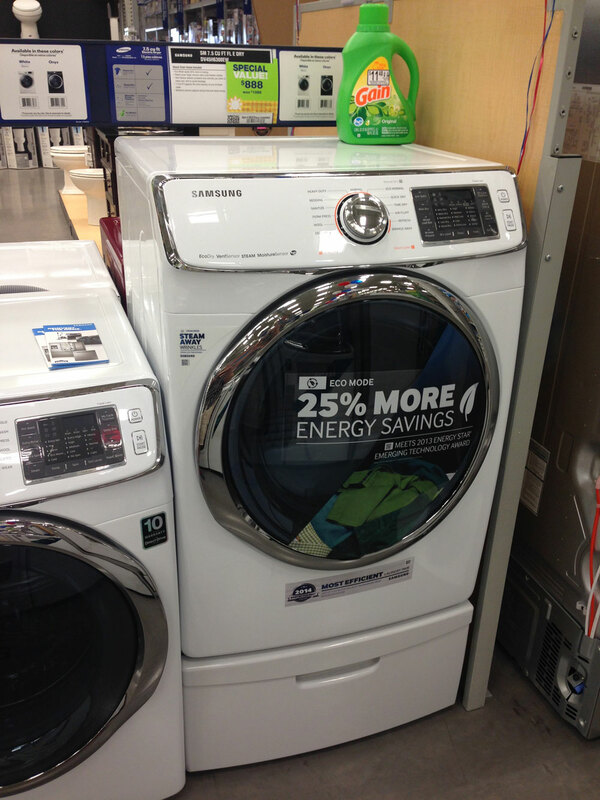 We found this Samsung Dryer – on sale – we ended up paying $719.10 for it. They deliver it on Saturday morning – then I will get to do our mountain of laundry! In addition, our new house had some plumbing issues as soon as we moved in. One of our toilets wouldn’t flush. The previous owners said to just plunge it and it will be fine. We plunged it multiple times, snaked the line more than once still to no avail. 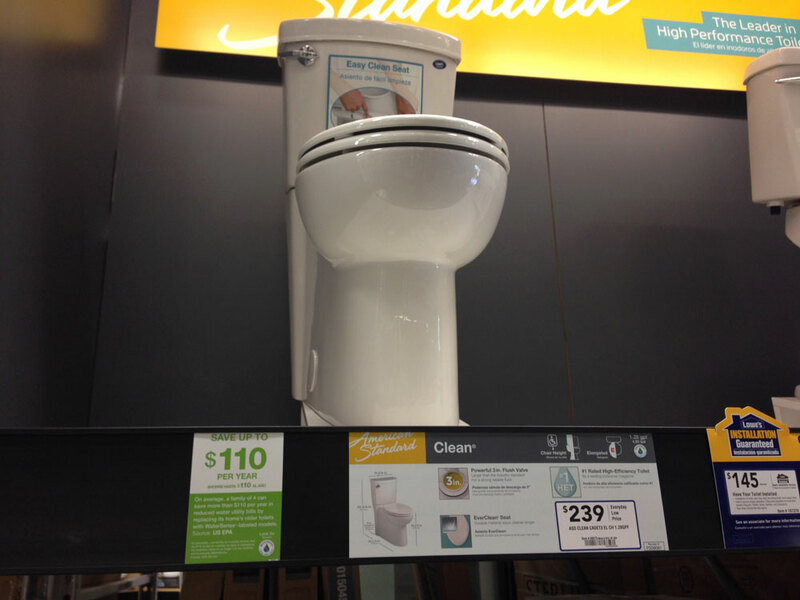 We had Roto-Rooter come out to look at it – he was pretty sure that it was the original builders grade toilet and was pretty sure that calcium build up was the cause. He suggested 2 things we could either use CLR and many different size pipe cleaners and get into all the mini-holes around the upper rim of the toilet or replace the toilet with a new one (which would have a better flow than the old one). He was almost 100% sure that was the problem and a new toilet would be the fix. If not, he left us with a quote of close to $400 to take everything apart and clean the drains. So, que the Lowe’s Gift Card (our saviour!) – we took the plumber recommended we stick with American Standard or Toto/Drake with a large trap. We spent $215.10 on a new American Standard Toilet and $5.39 on a new wax ring. Luckily we are pretty handy and Mark and his father, David, removed the old toilet and installed the new one. Everything seems to be working now – so far so good. Side note: I guess the neighbor’s son was concerned when he saw our toilet on the curb – and asked his mom where we were going to the bathroom. Hee hee. To round out our most recent Lowe’s mini-shopping spree – we purchased a plug for the Dryer ($16.19), a replacement mailbox flag (since our was snapped off when we moved in) ($3.58) and multiple other small things. The previous owner’s painted over every outlet and vent throughout the house. Originally I was thinking I could chip it off – but it was becoming very time consuming and the vents in particular were bent – so something new would be all fresh and white. Lots of cream colors were in this house (it was built in 1988), so the 1 outlet I did manage to get clean wasn’t even white. We started painting and working on the downstairs office room – so we bought 2 vent grills, outlet covers for switches and plugs (large 10-packs), new coax outlet (also painted over), some new work electrical boxes, a new hood filter for our stove, more 409 cleaning solvent and Mr. Clean Magic Erasers (I love these things – I profess my love for them more here). Thanks again to Tim at charlesandhudson.com and to Pete at dadand.com for letting me know about the giveaways to enter!